Red jerseys will fill the Vancouver Canucks’ side of the ice next week, as the team celebrates the Lunar New Year. 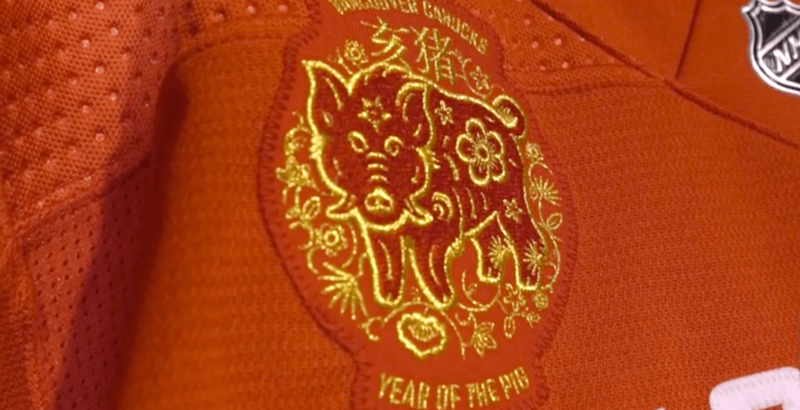 Back from their four-game road trip, the Canucks didn’t have a chance to celebrate the Year of the Pig at home on February 5. Instead, the Lunar New Year celebration will take place at Rogers Arena on Monday, as the team promises fans an evening of hockey, culture and tradition… and hopefully a win against the San Jose Sharks. Happy Lunar New Year #Canucks Fans! 🐷🏮 祝你猪年大吉! 恭喜发财! Players will trade in their usual blue and green jerseys for special red ones, featuring a gold Year of the Pig crest, during warm-up. A traditional lion dance performance will take place pre-game at 6:15 pm on the north plaza, while the first 10,000 fans to arrive will be given red envelopes as part of a prize giveaway. Once inside, fans will be greeted by a “quintessential night market” in sections 101-103, offering Lunar New Year merchandise, paper lantern making and calligraphy stations, and free samples of noodles, wontons, spring rolls, and beef brisket from Hon’s Wonton House. The Canucks have successfully celebrated different cultures in recent years, going beyond symbolic gestures. For Diwali in November, the fan experience included diyas painting, henna stations, Rangoli artwork demonstrations, and traditional South Asian food on the concourse, with Bhangra dancers outside the arena and a live musical performance by Jazzy B during the intermission. The Canucks held a First Nations Celebration last month, inviting Gino Odjick, first indigenous NHL player Fred Sasakamoose, two distinguished chiefs, and a council member to the game with a special pre-game ceremony.